Reach Out And Touch Someone :) And Add Them To The Database | HAIL DUBYUS! Hey, Our President says ordinary Americans have nothing to worry about. Of course, a few months ago, he said, tapping into phone conversations required a court order, and that was a lie, and then he said that it was limited to international calls and well, that seems to be fudging it just a little, but let’s give him the benefit of the doubt…he’s got to tell the truth SOMETIME! As we all know, terrorism isn’t limited to al-Qaida either…druggies, protestors, all sorts of people “support terrorism.” And don’t you feel safer knowing that those cell phone calls you made from the No-Tell Motel when you were supposed to be at a meeting in Albuquerque are now part of the government database? 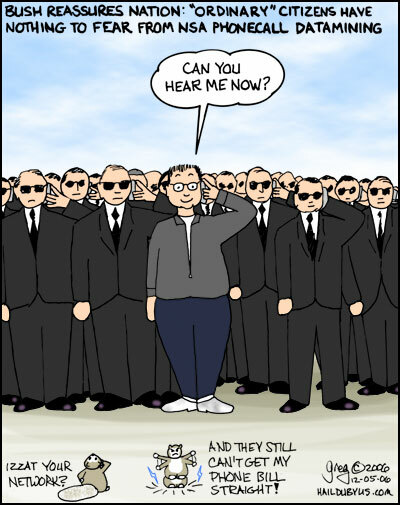 I’d prefer my skeletons remain in the closet, thank you … can you hear me now?